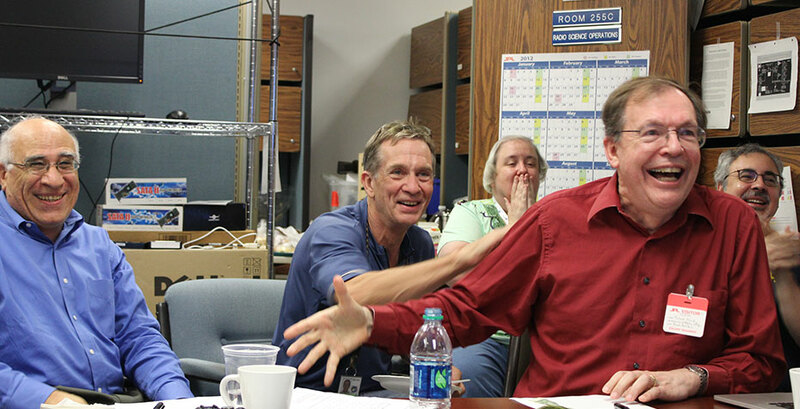 On October 23, Dean of Academic Affairs Richard G. French led the Radio Science Team in an experiment conducted during a flyby mission of the NASA Cassini spacecraft on Titan, a moon of Saturn. French belongs to an extensive community of Wellesley faculty and alumnae exploring new terrain on other planets. The purpose of flyby mission T-106 was to explore and analyze the liquid of the Kraken Mare sea on Titan, a Saturnine moon. According to NASA, Titan is the only other world in our solar system which has stable bodies of liquid; in Titan’s case, its seas are composed of mostly methane and ethane. During the flyby mission, the researchers “bounced” radio waves at particular angle so that the radio data traveled from the Kraken Mare almost one million miles to Earth. This is known as a bistatic scattering experiment. Despite the vast distance between Titan and Earth, the data from the experiment became available almost immediately to the research scientists gathered at the Jet Propulsion Laboratory in Pasadena, Calif.
Saturn isn’t the only planet being explored by Wellesley astronomers, however. M. Darby Dyar ’80 has been working with NASA to find the best way to analyze Mars’s rocks and soil using extraterrestrial rover Curiosity. Working with a team of scientists from across the United States, Dyar created ChemCam, a laser-based spectrometer that is used to determine the chemical composition of rocks on Mars in hopes of discovering water on the planet. Dyar began her career at Wellesley as an art history major, but was persuaded to take Geology 101 in order to fulfill a distribution requirement. After some initial anxiety, she came to love the subject enough to take on a double major. “The first day of class I slunk into the lecture hall and planted myself in the back row with a disinterested expression,” she says. "This rapidly changed when a woman walked in and gave a knock-your-eyes-out great lecture full of slides of cool geology and succinct explanations.” The professor, [now professor emerita of geosciences] Meg Thompson, eventually became a good friend and inspiration to Dyar. Wellesley students are already putting data gathered as a result of the astrogeologist’s work to use. Students of Wellesley professor and Mars Exploration Rover science team member Wesley Watters, whose research focuses on the impact cratering process, as well as the role of water on early Mars, use data gathered by the Mars rovers in courses like Planetary Climates to give students a better understanding of geological conditions and their implications beyond those on Earth. Still more faculty study other areas of astronomy, such as James Battat, whose work on dark matter and particle astrophysics includes millimeter-accurate measurements of Earth-Moon distance. Such findings can help scientists refine the theories of relativity and gravity. Other alumnae working in astronomical research include Faith Vilas ’73, who studies Mercury as the senior scientist at the Planetary Science Institute. Vilas has worked with NASA on data analysis for the MESSENGER spacecraft. Pamela Melroy ’83, an Alumnae Achievement Award recipient, is one of only two women to have commanded a space shuttle, and has logged nearly 50 days in space. Alex DeWolfe ’96 manages the Science Data Center for the Mars MAVEN. She is responsible for managing the data collected by the MAVEN spacecraft and ensuring that research scientists have access to the crucial information. Whichever planet they study, Wellesley's astronomical community demonstrates that exploring new terrain—whether through managing a NASA spacecraft or by setting foot into a geosciences classroom—is part of every Wellesley student’s experience.